You just finished a hearty meal for lunch and just got back to your cubicle. Suddenly, your eyes feel like they have some invisible weights in them that you can’t seem to keep them open. Your head feels like it has lost support that it tilts from one side to another. You badly want to slump at your desk or maybe crawl under it. This is a common scenario in the office. Oftentimes, energy levels seem to drop in the afternoon. A heavy meal does not help either as it adds to the drowsiness. 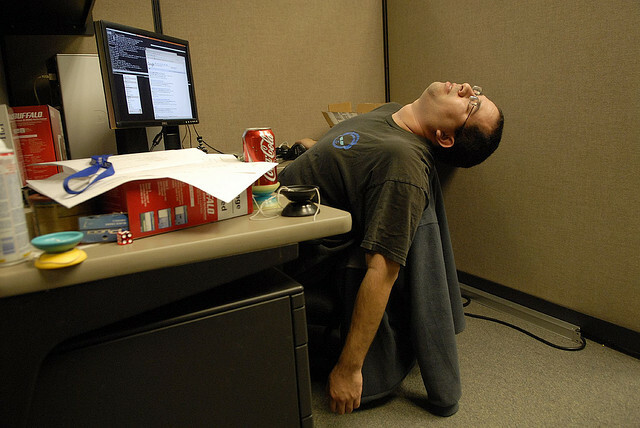 However, most workplaces (if not all) prohibit sleeping during office hours. Luckily, there are ways to fight off office lethargy. Here are some of them. Avoid sugary foods, carbohydrates and sodas. When people feel sleepy, there is a high chance that they will reach out for a bar of chocolate or a can of soda for an energy boost. It can indeed help to give you a kick start, however, when it wears off, it will make you feel more tired and your mind foggier than before. Stand up and walk around. As soon as you feel the sleepiness set in, get up and take a walk. The best way to fight off drowsiness is to remain active. Take a cigarette break (though you don’t have to smoke at all) and step outside for a breath of fresh air. You can perhaps go to the pantry to get yourself a cup of coffee or a glass of water. If you have something to photocopy, shred or give to an officemate, now is the time to do so when you feel like taking a nap. Help yourself to a cup of coffee. Yes, coffee indeed helps in fighting off drowsiness. For one, standing up and preparing a cup could help you avoid slumping in your chair. Coffee, when drank moderately, can immensely help in sustaining your energy level during a circadian dip. Sometimes, frequent sleepiness is a manifestation of an underlying disease or condition. Insomnia, sleep apnea and hypothyroidism can cause fatigue and sleepiness. Most people who suffer from depression often sleep excessively and still feel tired upon waking up. Excessive daytime sleepiness has also been linked to cardiovascular disease in adults. Confusing, eh? However, the best way to stay awake and alert all day is to get at least eight hours of sleep at night. The only way to remedy sleep deprivation is to provide your body with the rest it needs. Imagine how many road accidents happen just because drivers force themselves to drive for hours, even if they are sleep deprived. Most adults feel tired and drowsy through the day because of a sleep deficit. This is the main reason why most of us lack focus on work and concentrate poorly on daily tasks. However, one must note that sleep deprivation can eventually cause depression and anxiety in the long run. Get enough sleep if you want your quality of life to improve. Productivity increases once you are well rested and focused on your work.